Egg whites are laden with protein. This has long been the notion held by many fitness enthusiasts. What do you do with the cholesterol rich egg yolk then? I throw them away. At least this is what I have been doing until I heard the latest health buzz which claims that the yolk contains multitude of nutrients and vitamins. For those who have been guilty of wasting egg yolks like yours truly, the rest of the article may provide a different perspective as to how egg yolks can play a part in our diet. New findings indicate that the cholesterol in eggs can actually help to balance body cholesterol level. How does this work you may wonder. Our body regulates cholesterol level like it does body temperature and blood pressure. As such, when cholesterol level dips the body produces more cholesterol to compensate for the lack of it. Consuming whole eggs not only prevents the body from producing cholesterol but it is also reported to help elevate good cholesterol level in the body. If that is not enough to convince you to eat whole eggs, you may be persuaded by results of a recent study which indicate people who eat eggs for breakfast tend to lose weight more easily and maintain healthy body weight compared to those who regularly eat cereals for breakfast. The nutritional value of whole eggs is said to be the main factor in this study. Now before you go out and buy some eggs, it is worthwhile to note that not all eggs are made equal. Pastured eggs may be a healthier option than that sourced from your local hypermarket. A simple test performed on an egg bought from the grocery store and pastured egg reveals that the colour of egg yolk in the latter is noticeably darker. The rich, almost orange colour seen in the pastured egg suggests a higher content of carotenoids and nutrients. No doubt, there is a host of reasons to start eating whole eggs. Whatever your reason may be, do consume eggs in moderation just like everything else. By following a sensible and balanced diet you are well on your way to good health. You’re right! Eggs really are good for you, yolk and all. The yolk contains nearly half the protein in an egg. It also contains the cholesterol but cholesterol in our food isn’t what raises blood cholesterol. Saturated and trans fats do that, but eggs contain just a small amount of saturated fat and no trans fat. Egg yolk colour is an indicator of the type of feed the chicken ate. For example, the hens in central Canada are fed a corn-based diet which makes the yolks in their eggs a darker yellow than the hens in western Canada who dine on a wheat-based diet. Yet the nutritional value of the eggs is the same. That’s good to know. I absolutely love eggs! 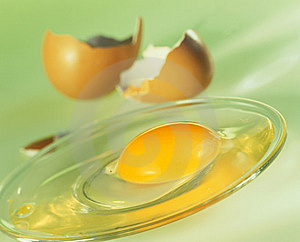 Egg yolk contains omega-6 fatty acids which is call Arachidonic Acid(AA). it synthesizes regulatory molecules such as prostaglandins. A healthy diet contains a balance of omega-3 and omega-6 fatty acids. High amount of omega-6 fatty acids may increase risk of several diseases and conditions, including depression.